**I did this lesson discussing the different places Paul traveled, and reviewed who he traveled with. We talked about how hard it was to travel in Paul’s time, without a car, plane, etc. No air conditioning and no Fast Food or Pizza! 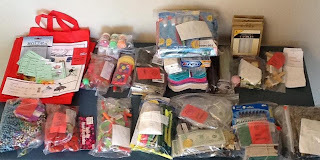 I bought stuff (see list) and we talked about whether or not Paul had the items to take with him and how we don’t need all the things we have, but think we need! This seems extreme, (to others, not to me) and can be changed to suit your own needs, but I look for stuff all year for this lesson. I have one other review for Paul that I do. And a review for Peter. I have been told by students that this is their favorite lesson, with Esther and Moses & the 10 Plagues next. As I teach this lesson, I (or probably my assistant) am handing out items that Paul may or may not have carried with him. We also have a worksheet that we check off as we go through the lesson. 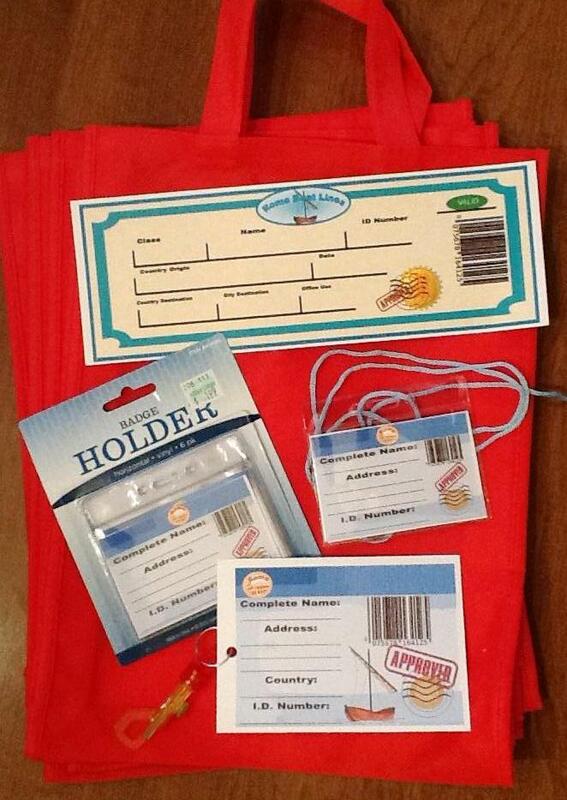 The kids pick up a tote bag to put the goodies in, a name tag and a travel ticket. Everything has their name on it. You can also talk about the different items as you check off the worksheet and have goody bags already loaded and ready to hand out. You can also skip the handouts. I have a suitcase that has a travel tag attached to it, also a burlap bag Paul might have used to carry his things. He probably would have used leather leftover from a tent. I also have another suitcase laying on the floor, with the goods in it that they can't see inside of. I layer the numbered bags of handouts, starting with the last to the first so I can just reach in and easily pull out as I am teaching. Some handouts listed have links to see what I used. Hand out worksheets. We are going to study about Paul's traveling today and what it took for him to preach about Jesus. 1. Suitcase (Point to the suitcases. ) Do you think Paul took suitcases with him when he traveled? hand out 1. tote bags and name tags for bags. How did Paul travel? Airplane, train, car...etc? Hand out 2. plane ticket and paper with different ways to travel Did he take jewelry with him? 2. Jewelry, hand out 3. beaded necklaces No, Paul didn't worry about material things like that. First, let's go back to the beginning! Our lessons about Paul are in Acts. Who wrote Acts? Luke. 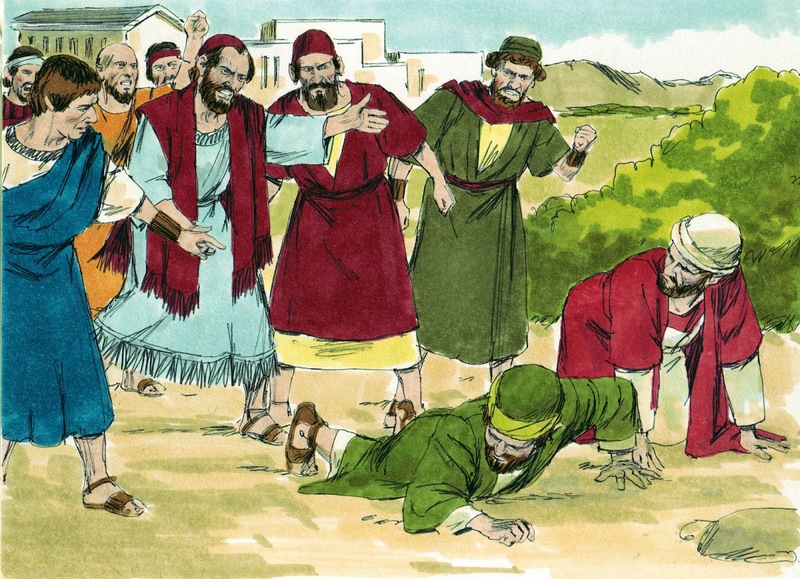 Luke first talks about Paul when Stephen was being stoned. Paul was probably a little over 30. Remember that he held the coats for the people that were stoning Stephen? God made Paul see the light. God talked to Paul from the light and said "Saul, Saul, why do you persecute Me?" 4. flashlight Remember that he was called Saul at that time? Well, he was blinded by the light and he changed his ways. He was baptized and started to tell everyone about Jesus. Remember that people were afraid of him? They talked to each other and said "Isn't that Saul of Tarsus? Isn't he the one that put Christians in prison?" They were scared to trust him. What if he was just saying these things to see who the real Christians were? 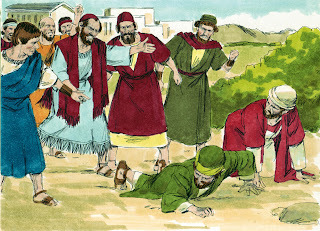 While Paul was in Damascus, some Jews were waiting to kill him, so his friends let him down the city wall in a basket. 5. Calculator, 6. iPod & headphones 7. Money, or 8. Car & house keys 5. magnifying glass & highlighter 7. Money Did he walk around waving his ID saying "Hey, I'm Paul, everyone listen to me?" No, of course not. People wanted to listen to Paul. Chick here to download poster. About this time, Saul starts being called Paul. He never officially changed his name, Luke just starts calling him Paul. In Acts 13:9, It says "Then Saul, who is also called Paul..." Saul was the Jewish translation and Paul was Latin. Paul was also the Roman version, which helped saves him later. We talked about Paul and Barnabas traveling together. They started in Antioch. Luke also tells us that the followers of Christ were first called Christians in Antioch. (Acts 11:26) This begins the journeys of Paul. These are usually broken down into 4 separate journeys. 9. Pen & paper & 10. Friends/Helpers Hand out 9. pens/notebooks Point to Tarsus on the map and tell students that is where Paul was born. 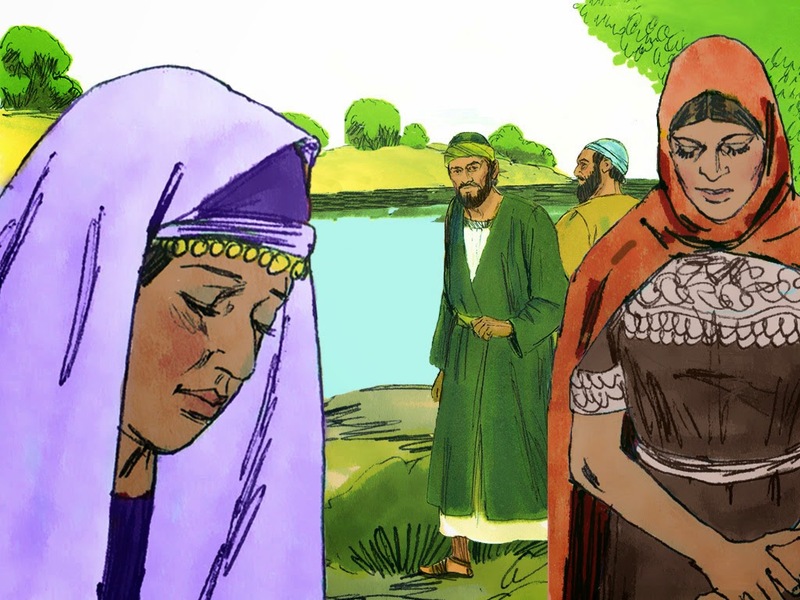 When Paul and Barnabas stopped at the island of Paphos, the Roman Governor wanted to hear what Paul had to say about God, but he had a magician that didn't want the Governor to listen to Paul. Elymas [EE'-luh-mus] was afraid that the governor would change his mind about his magic! 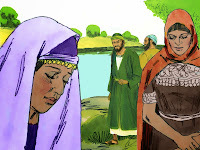 Paul told Elymas that he was full of dishonesty. Because of Elymas telling lies about Jesus, he would be blind for a time! Immediately, a dark mist came down on Elymas and Elymas walked around looking for someone to lead him by the hand! Now, more people are believing after seeing what God did to Elymas! The Governor believed and was amazed at what Paul was teaching about God. Now, for the 2nd journey, we studied about Paul when he was in Lystra. The people took him outside of the city and stoned him. They left him, thinking he was dead, but his friends came and took care of him. They travel and find Lydia in Philippi. She made purple cloth from shells. That color of purple could only be made there, and was very expensive. Lydia asked Paul and his friends to stay at her home with her. Paul didn't care what people said, he kept telling everyone about Jesus. Some listened, some didn't. Just like now. Paul wrote 1st Corinthians. 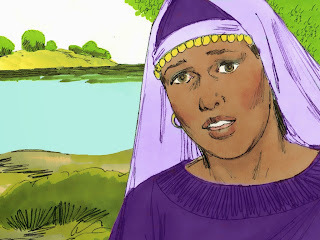 Last week we studied about Eutychus. The Christians gathered together to worship Jesus on the first day of the week, which is Sunday. In the fall, Paul went to Philippi, and wrote 2 Corinthians. In the winter, he went to Corinth and wrote the book of Galatians. In the spring the next year, Paul wrote Romans. *Click here to download the visuals. Lydia is not included because of copyright and can be downloaded free here. 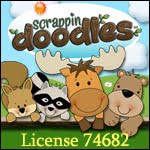 Items are from Dollar Tree, www.OrientalTrading.com, various party stores, Hobby Lobby, and other craft stores. This is the name tags. I purchased the badge holders at Hobby Lobby, with the 40% off, it is the cheapest for me, but you can find them a lot of places, including Ebay. The printables are for the horizontal. The whole plastic piece is about 3 1/2 x 3 1/4. I cut 7/8" ribbon 35" to go into the center hole (you can sew Velcro on the ends for the kids to attach around their necks), but decided to use some precut shoelace strings I had from another craft project. So, you can easily, buy thinner craft string to use in the outside holes. (See photo) You can print the name tags here. This is the luggage tags. I laminated the tags, then added the clips. The kids will attach them to their goodie bags. You can print these here. Click here to print the travel tickets. Click here to print the worksheet we used during the lesson. We used this worksheet to discuss how hard it was to travel and teach God's Word during Paul's time. 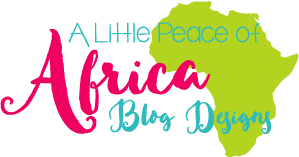 The kids can circle the ways that Paul and the early Christians would have traveled. You can print it here. You can download the free Lydia visuals here. Thanks so much! The kids really have fun! Debbie, I can't thank you enough for all of your wonderful posts! My friend and I are currently teaching a year long series on the book of Acts to our 3rd and 4th grade class. You always seem to be just a step ahead of us in posting about Acts. We are just entering Paul's missionary journeys. Wonderful, wonderful ideas. Thanks so much for the nice comment! Sorry I switched some of the lessons around on you! I have one more this week, then we will continue on with Agabas and the following. 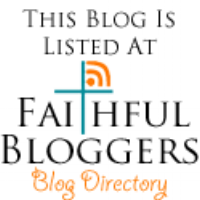 And, I like your blog also! I think this is an excellent lesson. I can see why the children love it. Thank you! The last class was first and second grade. Thanks for stopping by! This is so awesome!!!! Thank you so much! I will be using this with our kids.